A nation’s currency is much like a company’s stock. In the simplest of terms, the value of a company’s stock is derived by cutting up the company’s total worth by the number of shares in circulation. This same simplistic principle can be applied to the valuation of a nation’s currency, where cutting up the nation’s wealth by the number of units of currency in circulation gives you the value of each unit of money. But there arise circumstances that can temporarily see a company’s stock—or country’s currency—trade below its ‘calculated’ value. Entire investment funds are based on such disparities; value funds, for example, focus on buying stocks that are trading below their companies’ book value. Extend this idea to currency trading, and you can see why there is so much excitement around Iraq’s currency, the dinar. Investors consider the Iraqi dinar grossly undervalued, given the tremendous potential of Iraq’s oil-based economy, and are thus buying the dinar with great expectations. The same article quoted Fatih Birol, chief economist at the IEA, in an interview: "Production growth in oil and even in natural gas will provide the chance to transform Iraq's economy.” “Oil revenues can provide solid foundations for a prosperous country." And isn’t that what every value investor is counting on? The opportunity to buy a stock or currency while it is still cheap, before the company or country reaches its full economic potential? Indeed, it is going to happen eventually for Iraq. Many war-torn nations of the past emerged as economic power-houses after those initial rebuilding years; Japan and Germany among the best known. But how long does it take? Time is certainly one very important factor any investor needs to consider. Sure, Iraq’s oil revenues will likely double over the next decade. But what will the U.S. stock market do over the same period? How will a well-diversified portfolio of dividend stocks, growth stocks, and some precious metals perform? 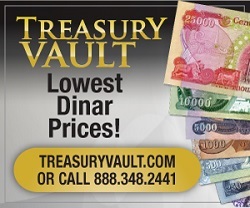 Is the dinar really worth such risk when there are so many safer choices right here at home? And even with a great appreciation in the value of the dinar over the coming years, the costs associated with jumping in and out of the trade are not of little consequence. Essentially, the quote you are getting could be highly skewed in your disfavor. Yet there is another very critical factor at play in trying to determine the soundness of the dinar as an investment, or of any currency for that matter: political uncertainty. A highly recommended read on the effects of political uncertainty on currency stability is the 2005 paper Politically Generated Uncertainty and Currency Crises by David Leblang of the University of Colorado and Shanker Satyanath of New York University. Of particular interest to our discussion here is their paper’s first section, “Causal relationship between political variables and currency crises”, where the pair examines two hypotheses, the first of which is that a new government increases the likelihood of a currency crisis.